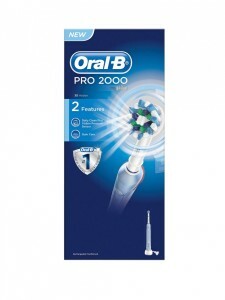 Patients at Canary Wharfs Platinum Dental have reported that using the Oral B PRO 2000 toothbrush helps them brush their teeth more accurately. A number of patients at the London dentist complained about sore gums and sensitive teeth until head dentist, Dr Misbah Junaid told them that they were brushing incorrectly and that investing in an Oral B electric toothbrush would tell each individual if they were brushing too hard or too softly. The electric brush is a worldwide leader featuring angled bristles, with a CrossAction brush head designed to effectively lift and power away more plaque than a regular manual toothbrush, leaving your teeth shining like pearls. The Pro 2000 with Cross Action brush head is inspired by professional cleaning tools to deliver a superior clean compared to a regular toothbrush. Set at a dynamic 16 degree angle for tooth-by-tooth brushing, CrissCross bristles are able to attack, lift and power away up to 100 per cent more dental plaque along the gum line than a regular manual toothbrush. The toothbrush comes with a 2 year warranty and the possibility of increasing it to three years. Contents included in the pack are a rechargeable toothbrush handle, charging station with brush head storage, one toothbrush head and one Cross Action head. A patient said: “I didn’t even realise that I was brushing too hard until Dr Junaid told me. I’d noticed my gums were receding but thought that this was normal with age. Dr Junaid recommended the oral B 2000 electric toothbrush because it had pressure sensors in and would help me stop brushing hard. I love it! I feel much better knowing that I can’t brush too hard anymore. Another patient also recommends the toothbrush as she said that her teeth are no longer sensitive and the small head on the toothbrush gives her teeth a more thorough clean and it gets rid of more stains than she could ever remove with her regular toothbrush. The Oral B brushes are available to purchase at many high street and online retailers such as Boots, Tesco, Asda, Amazon and Superdrug. We also sell the toothbrush at a discounted price of £45, so why not pop by the practice and pick one up. ← So you know what you want, but how can you pay for it?